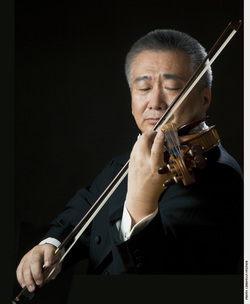 Acclaimed for his deep musicality and virtuosity, Chin Kim, one of the most versatile, and sought-after violinists today, has been concertizing extensively throughout North America, Asia and Europe as guest artist with orchestras as those of Philadelphia, St. Louis, Montréal, and Atlanta with conductors like Leonard Slatkin, John Nelson, Myung Whun Chung, and Sixten Ehrling. As recitalist, Mr. Kim appeared in major halls of New York, Boston, Philadelphia, Chicago, Montréal, Toronto, Brussels, and Seoul. 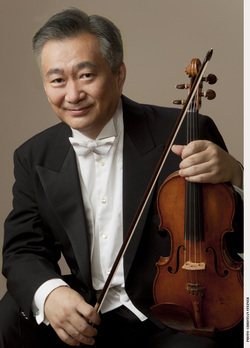 Top prizewinner in several of the most prestigious international violin competitions including the Concours International de Musique de Montréal, the Queen Elisabeth Competition, the Paganini Competition, and the International Violin Competition of Indianapolis, Mr. Kim’s recent concerts include the performance of Bernstein’s Serenade with the Atlanta Symphony, Barber Concerto with Wayne Chamber Orchestra, and the Glazunov Concerto with the Czech Philharmonic. Mr. Kim’s debut recording of Prokofiev’s Violin Concerto No. 2 in g minor with the St. Petersburg Philharmonic (Russia), under the baton of Paul Freeman, and the Prokofiev Sonata No. 2 in D Major with pianist David Oei, was released on the ProArte/Fanfare label. His second CD consisting of the Mendelssohn c minor, and the Tchaikovsky Piano Trio with the “Starr-Kim-Boeckheler Piano Trio” was released on the Mastersound label, and his most recent CD, the Glazunov and Tchaikovsky Concertos was recorded and released by Intersound/Fanfare label in the fall of 1995, following the performances of the Concertos with the Moscow Philharmonic in the Tchaikovsky Hall in Moscow, all to high critical acclaim. “Virtuoso,” “musically assertive,” “rich, golden tone” and “perceptive” are words of critical acclaim describing Mr. Kim’s performance of the Prokofiev Concerto No. 2 and Prokofiev Sonata No. 2 compact disc, “Kim’s deep, into-the-strings tone reminded me of a very favorite recording, the old David Oistrakh Soviet monaural recording,” “more than enough technique to master these piece…” are words describing the Tchaikovsky, and the Glazunov Concertos recording. Mr. Kim is the recipient of the Nan-Pa Prize awarded by the Nan-Pa Foundation in Korea, which is one of the highest honors given to a Korean-born musician. He graduated from the Curtis Institute of Music and, subsequently from the Juilliard School where he received the Petschek Award, and won the Concerto Competition which led to the performance of the Glazunov Concerto with the Juilliard Philharmonia in Lincoln Center. With his busy performing schedule, he also teaches at the Mannes College of Music in New York. His major teachers include Dorothy DeLay, Ivan Galamian, and Josef Gingold.